What better way to celebrate the Finland/Sweden rivalry than by using the Finns' Angry Birds to demolish the Swedes' furniture? Popular late-night talk-show host Conan O'Brien's show is finally available online in Finland. To celebrate his newfound audience (or should that be newfinned? ), Conan decided to honor Finland's greatest contribution to civilization: smash hit mobile game Angry Birds. 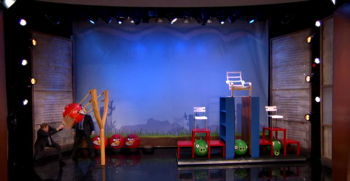 Conan wasn't just going to stop at playing a real-life version of Angry Birds, nosiree. Because the Finns hate the Swedes and vice versa, said Conan, he was going to further nationalize the situation by having the birds' green porcine nemeses take cover underneath furniture built by Swedish company Ikea. What follows is silly and cute - and showcases what is perhaps the least structurally sound Ikea furniture ever created. It also makes me think that a real-life Angry Birds would be a great game to have at an amusement park - you know, right alongside the water gun games where you get to win giant stuffed animals. Catch the full thing at Conan's website.